Written in rhyme, this story is reminiscent of the cautionary fairy tales of the past but with a happy ending. The Fearsome Beastie is hungry and likes nothing better than a yummy child to eat. He is crafty and cunning but will his demise, come from a little old Granny? Giles lives in East Sussex with his wife and two children. As well as ‘The Fearsome Beastie’, he has had several poetry books published including ‘There’s a Lion in my Bathroom’. His greatest influences were writers such as Roald Dahl and Shel Silverstein. He is also a musician and songwriter! ‘One heck of a good picture book.’ - The Booksniffer ‘Primary Times Love this book, it is a great story and the illustrations are fantastic.’ - The Primary Times ‘The Fearsome Beastie has won an Award!! !’ - BizzieBaby Gold award! You have taken children's books to new heights! Clever book...very hardworking author. Good luck, Giles! This is a great book for children of all ages. Good luck Giles! Lovely book, my little girl (2yrs) loves the beastie despite me thinking she might be a bit scared of him. suit to my kids! the author is fascinating! Wonderful Book. My newbourne would love this!! Good book and great illustrations!!! Wonderfully scary, kids are going to love it. Colin R. Parsons, author of The Curious World series of books. A wonderful and exciting piece of work. vibrantly illustrated with a great story that kids will love! Beautifully written and illustrated with rhyming, humour and imagination. Love this children's book - definitely a winner! 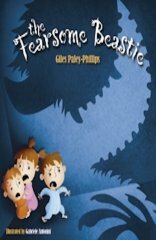 The Fearsome Beastie by Giles Paley-Phillips is an excellent picture book for children - I simply LOVE his book; and highly recommend it for your children. The Fearsome Beastie is a thoroughly engaging picture book that will entertain the child in anyone. Looks like a wonderful book! Great Minds would love the chance to review it. Kids love to be scared! This looks so cute...my nephews would love it! Fun rhyming tale with a bit of suspense and a twist at the end that is sure to amuse the little ones many times over! I'll look forward to reading this book to my little one. Best of luck! A nice Book for Children, good Luck for the Voting"
Love the cover art, love the rhythm and rhyme. Best of luck! It's a great concept for a book! I'm a children's librarian and found The Fearsome Beastie to be a great read aloud. The illustrations and story are wonderful to share with young children. I'm always a little sad when I read books like this and realize my "baby boy," is 15. The rhymn is perfect and I can remember how important the rhymning was when I read to Spencer. This book of course is a must - be prepared Mom and Dad - once read, you'll have to read it over and over and over and over - kids eat this sort of thing UP. Perfect for grandchildren - it absolutely must win. I personally think this is a great book! But more importantly my son thinks it is, as he puts it, "briwwyent" He loves it, i can honestly say it is his favorite book by far. I'm a children's bookseller, ex-primary teacher and a mum and I highly recommend this book with each of these hats on! Great text that flows beautifully and gorgeous illustrations. The perfect choice for storytime, either as a starting point for a discussion or just as a good fun read. Pauline. Book looks great! Like the illustrations. This is a charming book. Perfect to read to my grandsons. Loved this book and all the fun that goes with reading it to children. The Design of pictures, colour and pages means it is a book that could last generations. How refreshing to see an unashamedly scary book for 3-7 year olds. Nothing like a good scare to fire the imagination I'd say; gruesomeness certainly never did me any harm. Brilliant illustrations and set to rhyme too. Great work. My grandchildren love the book! It is a fun, adventurous book with great illustrations. Beautiful story and beautifully illustrated. I highly recommend this book. great book. wish I had had it to read to my grandsons. might just get it for them anyway. A book with a difference that appeals to children who like something a little on the scary side! My kids absolutely adore The Fearsome Beastie, so do I. "On a dark and snowy winter's night, When folk switch off the bedroom light..." Great hook, great book! Beautiful and enchanting story and illustrations! A absolutely adorable and fun book, perfect for bedtime. A definite must read! This is the type of book I would have loved as a child...or been terrified of as one! Just the type of book all kids need! Best wishes for this book. We love the Fearsome Beastie. Giles Paley-Phillips has got the balance just right in this book between dark peril and wonderful victory. This is a firm favourite at bedtime in our house. Easy to read and enjoyable too, I think I like it as much as my 2yr old does! This story line made me want to read more to see what happens. Children remember books in verse easier and I think Giles is onto a winner. Excellent book in the league of the Gruffalo!! A huge HIT in our house!! Cracking!! My daughter and I loved this book. This should totally be the winner!!! A lovely story that has been beautifully animated! I think I enjoyed thus book as much as my son! Well written. Kids will love this. Perfect book for all sorts of reasons..........great! Within reason, children enjoy a scary story. This one promises not to disappoint, yet not frighten them too much. Just simply a wonderful book!! enjoyable book - If i still had little ones I know they would like this book. good job! A fun and worthwhile book. Great book. Very well written. Excellent work!! very talented author!!! Good luck! Great children's book! I hope this book wins! My 3-1/2 yo granddaughter loved this book! One of the best books I've ever read with my children. I love it as much as my little ones. This story got a resounding cheer at the end when I read this to my daughters class for book week. You could watch the story unfold on the childrens faces as they were scared, surprised and delighted as the beastie hunted, tricked and finally got his comeuppance!! This book honourably tips it's cap to traditional folk tales with humour and illustrations that really bring the fearsome beastie to life - if you do not have this in your bookcase at home you need to run out and buy this now! Wonderful book! My children love to hear it read over and over!! We love The Fearsome Beastie in our house!! Excellent story and wnderful illustrations! I love this! Need I say more? Brilliant book that all 3 of my children really enjoyed, funny and a bit scary and thoroughly enjoyable to read. Read to kids - loved the drama! Brilliant book! Great story beautifully illustrated. This book is my sons favorite! Both my kids loved this book! A must read. A brilliant picture book, great for little and big kids alike! Good Luck! A fantastic book! Read it at your peril!! I absolutely love this book as an adult - it has that same wonderful edge to it as Roald Dahl for me. I have given several copies as gifts to friends children and everyone seems to love it just as much! What a talented writer, I can't wait for more books please. The Fearsome Beastie has that same wonderful traditional quality to it, just like classic books from ones own childhood did. Yet is fresh and in tune with today's modern kids. A rollicking, scary tale! Perfect for reading again and again. Destined to become a classic. Fantastic book, should be considered as the next Gruffalo! A brilliant book which I bought for our grandchildren as they had greatly enjoyed his previous book, 'There's a Lion in my Bathroom'. Bring on the next one, Giles! This book is absolutely fantastic! Well done Giles! Wonderful book by a very imaginative author. All children will love the Beastie! Deserves to be a classic! Excellent work by my friend Giles Phillips... please read you guys!! a great children's book, my 3 & 4 year olds love it, and still cower when we read it with the proper Beastie voices!! A top read and lovely illustrations.